Background Chronic myeloid leukemia (CML) cells can suppress the immune system by secreting programmed death receptor ligand-1 (PDL-1) that acts as a coinhibitory molecule for T cells leading to T-cell exhaustion and disease progression. Aim The aim of this study was to assess the plasma level of PDL-1 in patients with chronic myelogenous leukemia and its correlation with prognostic parameters and response to first-line therapy. Patients and methods This study was carried out on 40 patients with CML in chronic phase and 40 control healthy participants. 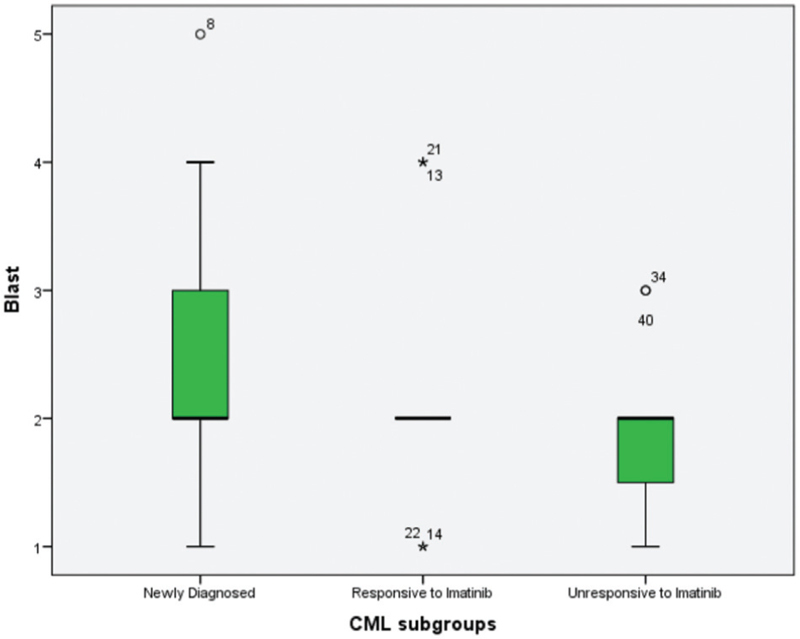 Patients with CML were subdivided into three subgroups, including 11 newly diagnosed patients, 17 imatinib mesylate-responding patients, and 12 imatinib-resistant cases. All patients were subjected to laboratory investigations including complete blood count, peripheral blood smear examination, bone marrow aspiration (if indicated), quantitative real-time PCR for Philadelphia chromosome, and plasma PDL-1 measurement by enzyme-linked immune sorbent assay. Results Our results showed high plasma levels of PDL-1 in patients with CML. Plasma PDL-1 levels showed a negative correlation with total lymphocyte count in imatinib-resistant subgroup. Imatinib-resistant subgroup showed a significant decreased level of PDL-1 versus newly diagnosed subgroup of patients with CML. The suggested PDL-1 cut-off value for prediction of patients with CML was 1327.5 ng/l. Conclusion Patients with chronic-phase CML (newly diagnosed, imatinib responding, and imatinib resistant) showed a highly significant increased PDL-1 level compared with the control group. Increased plasma PDL-1 level is a predictive risk factor for CML incidence and disease progression. Molecular monitoring for a patient with CML undergoing therapy provides important prognostic information, and international treatment recommendations incorporate specific time-dependent molecular milestones to help determine whether a patient is responding optimally ([Table 1]) . Descriptive analysis of the demographic and laboratory characteristics of the studied patients is shown in [Table 2]. Patients with CML (group I) showed a highly significant (P=0.000) increased plasma PDL-1 level, which ranged between 1496 and 3997 ng/l, with mean±SD of 2506.7±649.8, in comparison with control group, as PDL-1 ranged between 901 and 1159 ng/l, with mean±SD of 1068.1±80.3 ng/l ([Figure 1]). Moreover, each patient subgroups A, B, and C exhibited a highly significant increased PDL-1 level versus the control group (P=0.000 for each), as PDL-1 in subgroup A ranged between 1496 and 3997 ng/l, with mean±SD of 2648.0±825.6; in subgroup B, ranged between 1626 and 3594 ng/l, with mean±SD of 2484.7±670.9; and in subgroup C, ranged between 2000 and 3539 ng/l, with mean±SD of 2408.3±437.5 ([Figure 2]). Figure 1 Programmed death receptor ligand-1 levels in controls and chronic myeloid leukemia groups. Figure 2 Programmed death receptor ligand-1 levels in chronic myeloid leukemia subgroups. Patients in subgroup C (imatinib resistant) showed a significantly decreased PDL-1 levels (P=0.020) in comparison with those in subgroup A (newly diagnosed patients) ([Table 3]). In newly diagnosed patients, blast cells ratio ranged between 1 and 5%, and PCR ratio at diagnosis ranged between 2.0 and 100%. In imatinib-responder cases, blast cells ratio ranged between 1 and 4%, and PCR ratio at recruitment ranged between 0.0 and 0.04%. 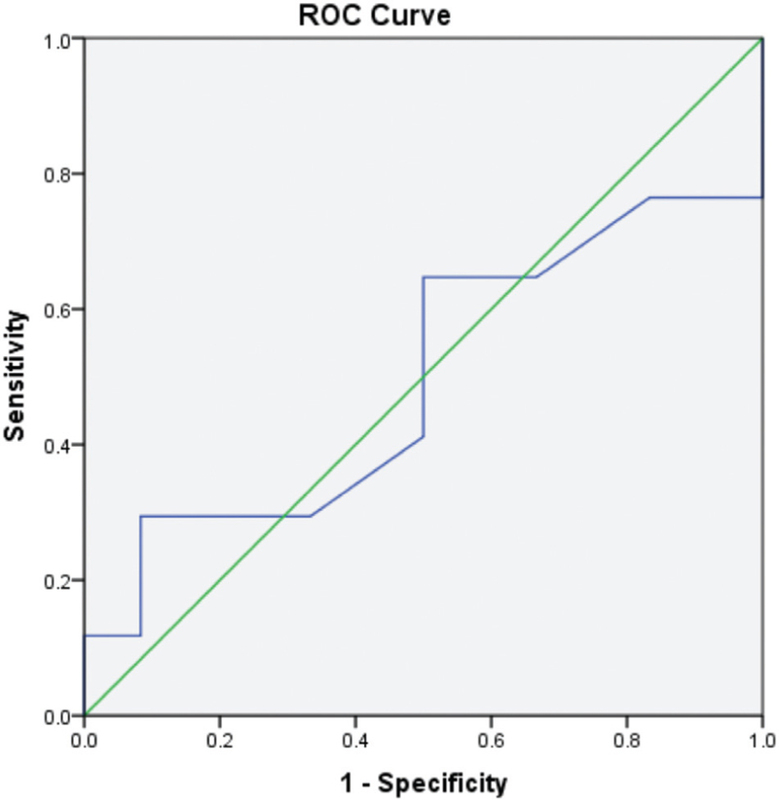 In imatinib-resistant patients, blast cells ratio ranged between 1 and 3%, and PCR ratio at recruitment ranged between 0.29 and 84% ([Figure 3] and [Figure 4]). 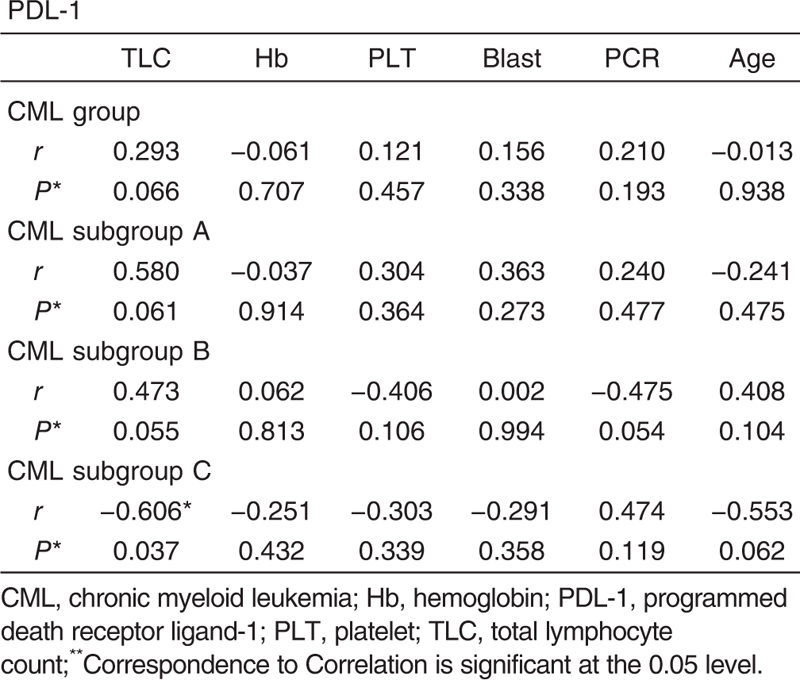 Figure 3 Blast ratio in chronic myeloid leukemia subgroups. Figure 4 PCR ratio in chronic myeloid leukemia subgroups. Subgroup B showed a significantly decreased PCR ratio versus subgroup A (P=0.010), whereas subgroup C showed a highly significant increased PCR ratio versus subgroup B (P=0.000) ([Table 4]). PDL-1 did not show any significant correlation with complete blood count parameters, blast cells, or PCR ratios in CML subgroups except a negative (r=−0.606, P=0.037) correlation with TLC in imatinib-resistant patients (C) ([Table 5]). 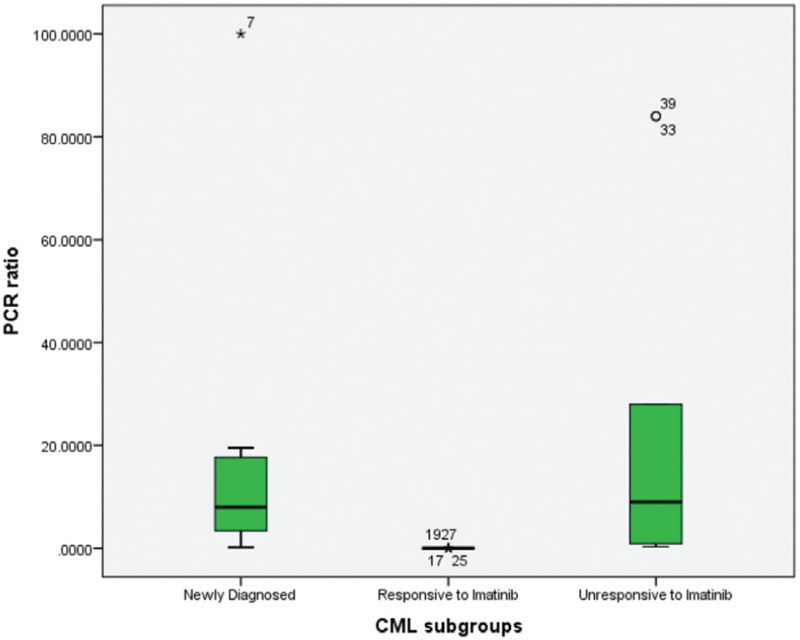 The suggestive cut-off value for diagnosis of CML is 1327.5 ng/l, but the cut-off value between responsive and resistant CML subgroups cannot be detected, as there is no significant difference between both groups ([Figure 5]). Figure 5 Cut-off value between imatinib-responsive and imatinib-resistant subgroups, receiver operating characteristic curve. Mumprecht S, Schürch C, Schwaller J, Solenthaler M, Ochsenbein AF. Programmed death 1 signaling on chronic myeloid leukemia-specific T cells results in T-cell exhaustion and disease progression. Blood 2009; 114:1528–1536. Santarpia M, González-Cao M, Viteri S, Karachaliou N, Altavilla G, Rosell R. Programmed cell death protein-1/programmed cell death ligand-1 pathway inhibition and predictive biomarkers: understanding transforming growth factor-beta role. Transl Lung Cancer Res 2015; 4:728–742. Sheppard KA, Fitz LJ, Lee JM, Benander C, George JA, Wooters J et al. PD-1 inhibits T-cell receptor induced phosphorylation of the ZAP70/CD3zeta signalosome and downstream signaling to PKCtheta. FEBS Lett 2004; 574:37–41. Herbst RS, Soria JC, Kowanetz M, Fine GD, Hamid O, Gordon MS et al. Predictive correlates of response to the anti-PD-L1 antibody MPDL3280A in cancer patients. Nature 2014; 515:563–567. Wilkinson TMA. Immune checkpoints in chronic obstructive pulmonary disease. Eur Respir Rev 2017; 26:144. Karwacz K, Bricogne C, MacDonald D, Arce F, Bennett CL, Collins M, Escors D. PD-L1 co-stimulation contributes to ligand-induced T cell receptor down-modulation on CD8+ T cells. EMBO Mol Med 2011; 3:581–592. Guan H, Wan Y, Lan J, Wang Q, Wang Z, Li Y et al. PD-L1 is a critical mediator of regulatory B cells and T cells in invasive breast cancer. Sci Rep 2016; 6:35651. Christiansson L, Söderlund S, Svensson E, Mustjoki S, Bengtsson M, Simonsson B et al. Increased level of myeloid-derived suppressor cells, programmed death receptor ligand 1/programmed death receptor 1, and soluble CD25 in Sokal high risk chronic myeloid leukemia. PLoS One 2013; 8:e55818. Siegel RL, Miller KD, Jemal A. Cancer statistics, 2015. CA Cancer J Clin 2015; 65:5–29. Silver RT. Chronic myeloid leukemia. Hematol Oncol Clin North Am 2003; 17:1159–1173. Kurzrock R, Gutterman JU, Talpaz M. The molecular genetics of Philadelphia chromosome-positive leukemias. N Engl J Med 1988; 319:990–998. Medina J, Kantarjian H, Talpaz M, O’Brien S, Garcia-Manero G, Giles F et al. Chromosomal abnormalities in Philadelphia chromosome-negative metaphases appearing during imatinib mesylate therapy in patients with Philadelphia chromosome-positive chronic myelogenous leukemia in chronic phase. Cancer 2003; 98:1905–1911. Faderl S, Talpaz M, Estrov Z, O’Brien S, Kurzrock R, Kantarjian HM. The biology of chronic myeloid leukemia. N Engl J Med 1999; 341:164–172. Baccarani M, Deininger M, Rosti A, Hochhaus A, Soverini S, Apperley JF et al. European Leukemia Net 2013 recommendations for the management of chronic myeloid leukemia. Blood 2013; 122:885–892. Kantarjian H, O’Brien S, Jabbour E, Garcia-Manero G, Quintas-Cardama A, Shan J et al. 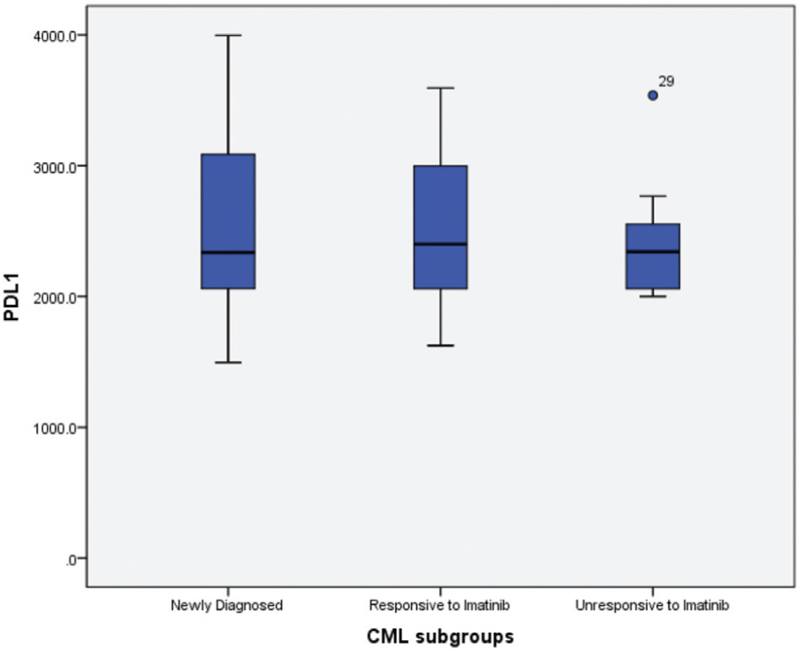 Improved survival in chronic myeloid leukemia since the introduction of imatinib therapy: a single-institution historical experience. Blood 2012; 119:1981–1987. Muller L, Pawelec G. Chronic phase CML patients possess T cells capable of recognizing autologous tumour cells. Leuk Lymphoma 2002; 43:943–951. Giallongo C, Parrinello N, Brundo M, Cava P, Rosa M, Bramanti V et al. Myeloid derived suppressor cells in chronic myeloid leukemia. Front Oncol 2015; 5:107. Matte-Martone C, Venkatesan S, Tan HS, Athanasiadis I, Chang J, Pavisic J, Shlomchik WD. Graft-versus-leukemia (GVL) against mouse blast-crisis chronic myelogenous leukemia (BC-CML) and chronic-phase chronic myelogenous leukemia (CP-CML): shared mechanisms of T cell killing, but programmed death ligands render CP-CML and not BC-CML GVL resistant. J Immunol 2011; 187:1653–1663. Pardoll DM. The blockade of immune checkpoints in cancer immunotherapy. Nat Rev Cancer 2012; 12:252–264. Greaves P, Gribben JG. The role of B7 family molecules in hematologic malignancy. Blood 2013; 121:734–744. Jitschin R, Braun M, Buttner M, Dettmer-Wilde K, Bricks J, Berger J et al. CLL-cells induce IDOhi CD14+HLA-DRlo myeloid-derived suppressor cells that inhibit T-cell responses and promote TRegs. Blood 2014; 124:750–760. Chen X, Liu S, Wang L, Zhang W, Ji Y, Ma X. Clinical significance of B7-H1 (PD-L1) expression in human acute leukemia. Cancer Biol Ther 2008; 7:622–627. Thompson RH, Gillett MD, Cheville JC, Lohse CM, Dong H, Webster WS et al. Costimulatory B7-H1 in renal cell carcinoma patients: indicator of tumor aggressiveness and potential therapeutic target. Proc Nat Acad Sci USA 2004; 101:17174–17179. Zhang P, Su DM, Liang M, Fu J. Chemopreventive agents induce programmed death-1-ligand 1 (PD-L1) surface expression in breast cancer cells and promote PD-L1-mediated T cell apoptosis. Mol Immunol 2008; 45:1470. Ghebeh H, Lehe C, Barhoush E, Al-Romaih K, Tulbah A, Al-Alwan M et al. Doxorubicin downregulates cell surface B7-H1 expression and upregulates its nuclear expression in breast cancer cells: role of B7-H1 as an anti-apoptotic molecule. Breast Cancer Res 2010; 12:R48. Sheng J, Fang W, Yu J, Chen N, Zhan J, Ma Y et al. Expression of programmed death ligand-1 on tumor cells varies pre and post chemotherapy in non-small cell lung cancer. Sci Rep 2016; 6:20090. Kreutzman A, Ladell K, Koechel C, Gostick E, Ekblom M et al. Expansion of highly differentiated CD8+ T-cells or NK-cells in patients treated with dasatinib is associated with cytomegalovirus reactivation. Leukemia 2011; 25:1587–1597. Kereskai L, Vass J, Kneif M, Pajor L. Correlation between BCR-ABL expression and tumor burden is restricted to the transition from minor to McU0r cytogenetic response in interferon treated CML patients. Oncol Res 2003; 9:174–179. Manlove L, Schenkel J, Manlove K, Pauken KE, Williams RT, Vezys V, Farrar MA. Heterologous vaccination and checkpoint blockade synergize to induce antileukemia immunity. J Immunol 2016; 196:4793–4804. Riether C, Gschwend T, Huguenin A-L, Schürch CM, Ochsenbein AF. Blocking programmed cell death 1 in combination with adoptive cytotoxic T-cell transfer eradicates chronic myelogenous leukemia stem cells. Leukemia 2015; 29:1781–1785. McClanahan F, Hanna B, Miller S, Clear AJ, Lichter P, Gribben JG, Seiffert M. PD-L1 checkpoint blockade prevents immune dysfunction and leukemia development in a mouse model of chronic lymphocytic leukemia. Blood 2015; 126:203–211. Takada K, Toyokawa G, Okamoto T, Akamine T, Takamori S, Katsura M et al. An immuno-histochemical analysis of PD-L1 protein expression in surgically resected small cell lung cancer using different antibodies and criteria. Anticancer Res 2016; 36:3409–3412. Sun WY, Lee Y, Koo J. Expression of PD-L1 in triple-negative breast cancer based on different immunohistochemical antibodies. J Transl Med 2016; 14:173. Lin AH, Twitty CG, Burnett R, Hofacre A, Mitchell LA, Espinoza FL et al. Retroviral replicating vector delivery of miR-PDL1 inhibits immune checkpoint PDL1 and enhances immune responses in vitro. Mol Ther Nucleic Acids 2017; 6:221–232.